Once again there were two sections for today’s quads. This time NMs Harris and Lowinger were joined by two bright young experts, Brandon Nydick and Jason Shi. Lowinger was upset in round two when he lost to Shi allowing Harris to finish in sole first place. In the second section another young prodigy, William Graif, made minced meat of the competition, scoring 3/3. 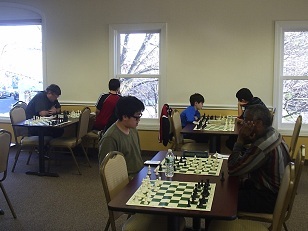 Melvin Patrick and Matthew Chan both had solid performances and both picked up a couple of rating points.